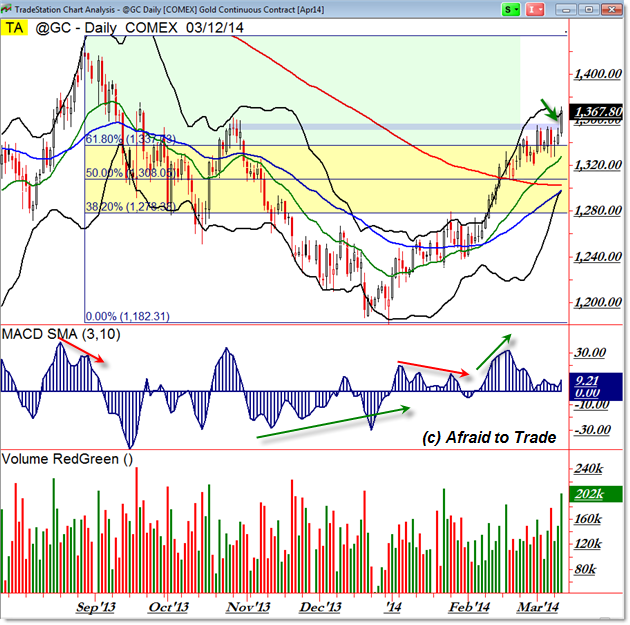 Gold prices broke through a ceiling of resistance this morning into an Open Air pocket, generating an aggressive breakout buy opportunity for traders. Let’s chart the breakout and note new upside price targets that are now active as long as price remains above the breakout price. As I’ve been highlighting to members of the Weekly Intermarket Strategy Membership, we have a critical confluence resistance or inflection level for gold into the $1,350 level. It’s an important inflection level that happens to trade next to two Fibonacci retracement grids as shown. The grid above highlights the $1,337 level and the grid below highlights $1,350 directly. Beyond Fibonacci, we see price showing a strong upward rally off the $1,200 low – a short-term bottom for now – which has seen increased momentum and volume (suggesting additional price continuation to hte upside is likely). If price (buyers) can hold above the breakout this week, it suggests that the next tradable swing will be up through “Open Air” (no major or obvious resistance levels overhead) toward the $1,400 “round number” target or the $1,420 prior swing high for a valid upside target. Keep in mind that price can form extended swings (impulses) on breakouts above Bollinger Band highs (reference the February 2014 breakout event). 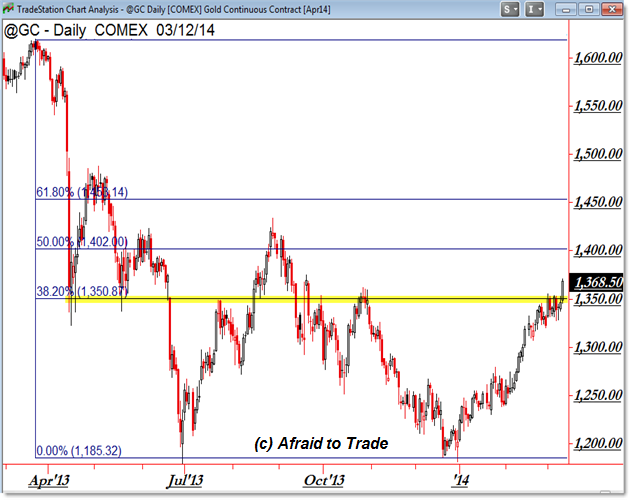 The main idea is that if gold can hold above $1,350 – meaning we don’t see an immediate return under $1,350 to trigger a violent Bull Trap Scenario and Outcome – then the tradable expectation is that price will continue its upward impulse (see August 2013) toward the $1,400 then perhaps $1,425 price cluster. Keep in mind that bears/short-sellers who logically short-sold into the $1,350 resistance area will collectively help propel the price of gold higher through open air as their stops are triggered at higher price levels.